As Christmas once more approaches, my thoughts turn once again to gastronomy and feasting. I was browsing one of our photo albums and found a menu tucked in it from Christmas 1999. We had taken the Bristol down to Nice for two weeks intending to get away from the usual family chores. As the person known as the chef; I could rarely escape the cooking duties. If truth be told, I preferred it that way. I was always appalled by the cremated over-cooked dry flaking turkey served up if I didn’t cook. This year we plan to have our indulgence at home alone. Goose is planned. We will have recently returned from a seven-day break with B’s mother in Madeira. I’m looking forward to that. I have no mother in law issues. I get on well with Jean… mostly. 1999 was perhaps out most memorable Christmas holiday. We took the, then new to us, Bristol 412 for its first long trip. We had booked into a modest Nice city centre hotel, intending to spend on eating and travel rather than fancy sleeping arrangements. The hotel unfortunately did not have parking, I was appalled at the idea of leaving the precious Bristol in the chaotic anarchy that passes for parking there. In the event I found a safe place for it, parked up and hired a little crappy Korean runabout for the city battle. 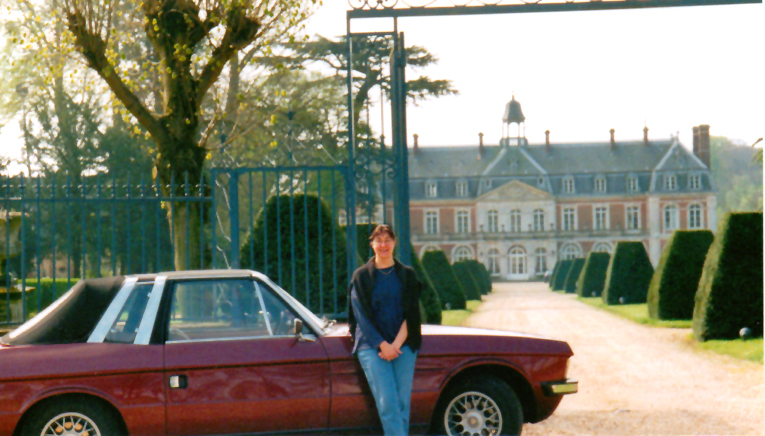 This picture is B outside a splendid Château in Burgundy we spent a night in on the way down. 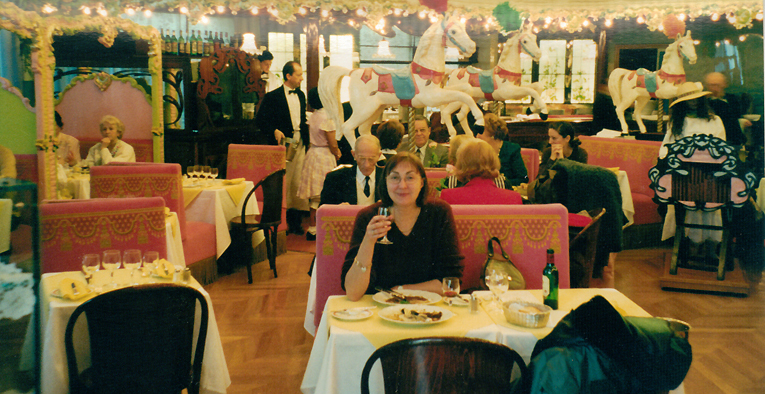 The main picture here is B at dinner on Christmas day in the Negresco. The menu is reproduced here and is fascinating for being priced in Franks. Remember those? There were about ten per pound sterling as I recall. This menu was 380F. I can’t recall which of these I had but have ideas it was the Capon for main. I do remember being amused and a little appalled by the shocking pinkness of the room, the old ladies in furs that smelled of moth-balls and the shaggy ancient French poodles under their tables! 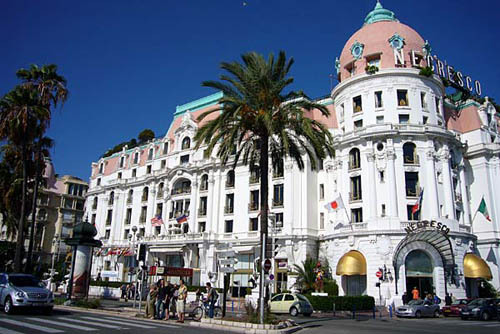 La Direction et les Collaborateurs de Hôtel Negresco vous souhaitent de merveilleuses fêtes de Noël. Six Hutîtres spéciales à l’échlote et vinaigre. Chapon de Méditerranée rôti, pommes écrasées à la fourchette, persil frit et jus de bouillabaisse. Lotte rôti, boullion de champignobs des sous-bois, lard croustillant. Loup crit sur la peau, ragoût d’artichauts au romarin, parfumé à l’orange. Chapon fermier, gratin de côtes de blettes à la moelle, grosses frites au poivre noir. Filet de bœuf rôti, gnocchis et cépes poêlés, sauce au vin rouge. Bûche chocolat, noisettes du Piémont caramélisées. Food and it’s enjoyment has been a great bond between B and I. She was wooed with food when first we met. Thai prawn red-curry and Tom-yam soup were the first things I cooked for her. As a wooing aid it was wildly successful! Food, wooing, travel and loving are much used themes in my novels. I wonder why that could be? Previous Article The review maze. Next Article A Trippy Tale for children age six to sixty.